Roasted Chicken, Green Beans & Potatoes. An easy and delicious one pan meal that comes together quickly and is packed with flavor! Happy Friday!!! Even though the holidays have passed, our weekends are still packed with festivities! This weekend we are celebrated my friends sons 3rd birthday and my brothers 27th. I love a one dish meal and this one I have to give credit for the idea to my sis in law Jen. When she told me she had made this I went out and picked up everything to make it the next day. This Roasted Chicken, Green Beans & Potatoes reminds me of the green beans and tomatoes side dish my grandmother makes, very rustic Italian. Dinner does not need to be complicated, especially on a day with nowhere near enough hours! This is so super simple and really flavorful… and the bonus is that it is really inexpensive! 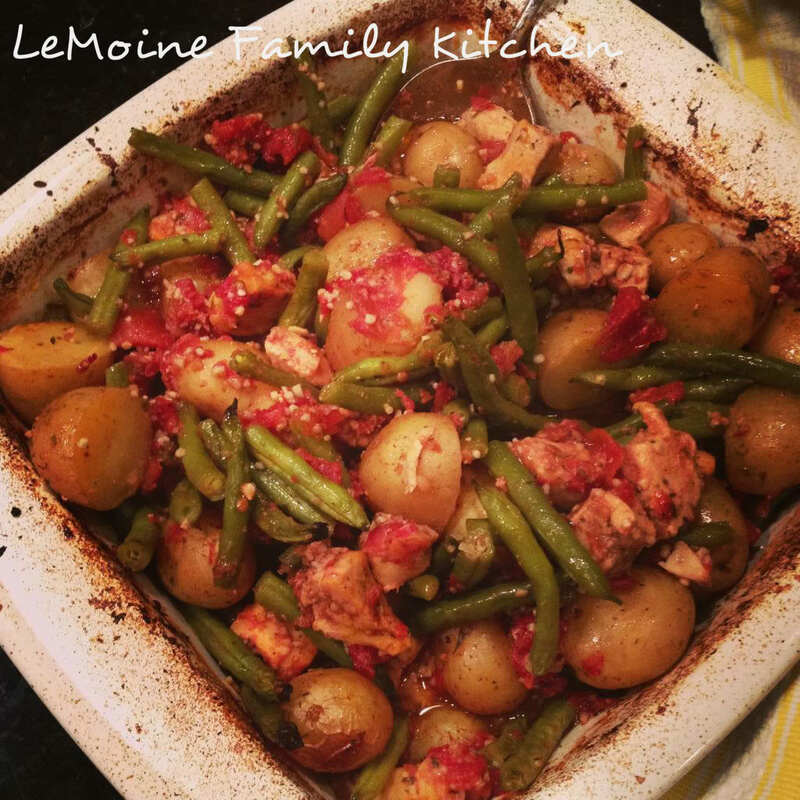 I only used a couple chicken breasts and bulk it up with fresh green beans, potatoes and canned diced tomatoes then simply seasoned to yummy perfection. Into a 10 x 10 baking dish add the green beans, the potatoes (larger ones cut in half) and the can of diced tomatoes including the juices. Add the chicken as well, the garlic seasoning, oregano, salt (a little if there is salt in garlic seasoning) and pepper. Add the olive oil and toss. Roast, covered with foil, for 1 hour. Stir half way through. Remove the foil, stir again and cook another 30-45 minutes. You are looking for the chicken to be cooked through and the potatoes tender.